Ginger Fried Teriyaki Tofu with Broccoli - Kosher In The Kitch! Ginger Fried Teriyaki Tofu with Broccoli - Kosher In The Kitch! Cut tofu into cutlets or squares about 1 inch thick. Prepare frozen broccoli as per package instructions. Mix flour with salt and powdered ginger. Once the tofu feels dry to the touch dip once in flour pressing firmly to coat lightly, and then dip into the eggwhite and back into flour a second time. Prep frying pan with oil, test heat with a bit of egg and flour. If the mix sizzles as soon as it hits the pan, you’re ready. Slowly lay the cutlets into the oil and let it fry about 2-3 minutes each side until golden brown. 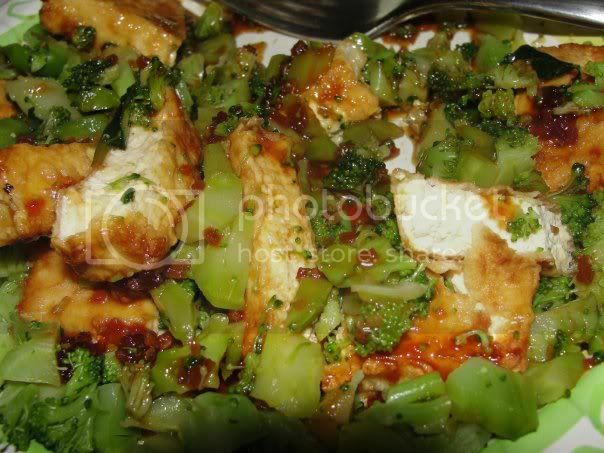 After frying all of your cutlets, place broccoli on plate then cutlets and drizzle a liberal amount of your favorite teriyaki sauce on it. This recipe can be served with rice, or, in a wrap as a sandwich.